Mangaluru, June 27,2017: DK District in-charge Minister B Ramanatha Rai has appealed to the people not to pay heed to any rumours aimed at disrupting communal harmony in the district. Addressing press persons here on June 27, Tuesday, Rai said he has been constantly working for the development of the district since the past several years. There is a need for everyone to join hands to strengthen peace in the district, he said. 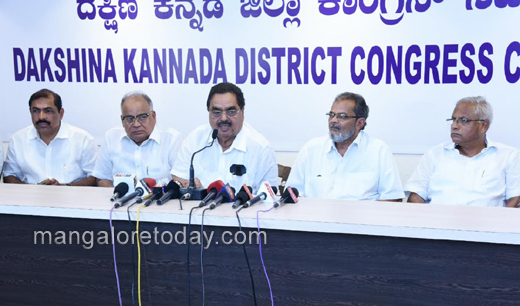 Referring to the recent untoward incidents in Bantwal, particularly in Kalladka, Rai said "the Sangh Parivar which could not digest communal harmony was creating disturbances." On the Ashraf murder case, Rai said the prime accused in the case was seen sharing the dais with Kalladka Prabhaker Bhat. On the viral video wherein he is seen instructing the then SP Bhushan G Borase to arrest Kalladka Prabhaker Bhat, Rai said as he was deeply disturbed by the violence, he had summoned the SP and had asked him to take action against those delivering hate speeches. Rai refuted the Sangh Parivar allegation that he was playing vote bank politics to appease minority community, and said his only intention was development of the district. Stating that he has received a number of threats, the minister declared that he did not fear threats. JR Lobo, MLA, Mithun Rai, District Youth Congress Chief, Ibrahim Kodijal, Interim President of Youth Congress and others were present.